Thin film magnetic media is inherently more efficient than particulate iron oxide. Now with the introduction of the Eikon Series 600 disk, thin film is also more cost effective. The traditional magnetic storage media has been particulate iron oxide. However, as performance demands have increased in the disk drive industry, it has become clear that particulate iron oxide has definite limits. 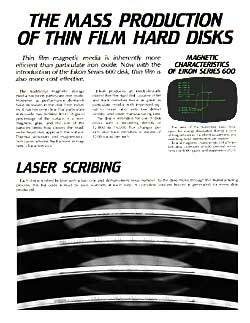 A good percentage of the surface is a non­magnetic glue, and the size of the particles limits how closely the read/ write head may approach the surface. Thermal sensitivity and magnetostriction cause adverse fluctuations in magnetic charactertistics. Eikon produces an electrolytically plated thin film rigid disk capable of bit and track densities twice as great as particulate media, with improved signal to noise ratio, very low defect density, and lower manufacturing cost. The disk is intended for use in disk drives with a recording density of 12,000 to 16,000 flux changes per inch and track densities in excess of 1200 tracks per inch. The area of the hysteresis loop measures the energy dissipated during a cycle of magnetization. Excellent squareness and switching field distribution are shown. Typical magnetic characteristics of a Series 600 disk: coercivity of 600 oersted, remanence of 8000 gauss, and squareness of 0.9. Each disk is scribed by laser with a bar code and alphanumeric serial number. As the disks move through the manufacturing process, this bar code is read by laser scanners at each step. A complete process history is generated for every disk produced.